With Only 4 Ingredients Make The Best Pie Crust Ever! Are you struggling to find something to make the holiday dessert table pop? This next trick is for you! There is nothing better than having friends and family over for the holidays. The sights and sounds are memories that will last a lifetime. Yet with all those holiday dinners under your belt how do you change it up year after year? Well, we found a way to make those pie crust the topic of conversation! When a pie is baked perfectly, as you will see later in this article it is sweet, savory and the crust just melts in your mouth. This is because a truly divine pie crust will be browned just right and will look and taste like it is worthy of a first place blue ribbon. However, getting homemade pie crust to turn out just like that can be very frustrating. This is the very reason most people buy pre-made pie crusts from the store. However, if you really want to bake a pie and you are sadly all out of pie crusts, don’t panic. 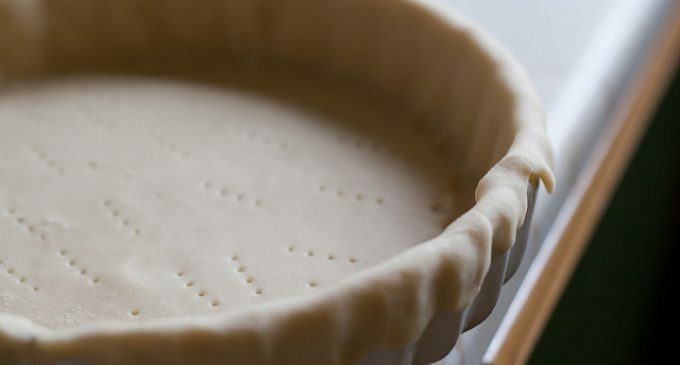 You can just make this foolproof easy pie crust out of two basic yet surprising ingredients you already have in your cabinet.